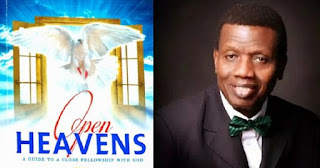 Open Heaven [18 May 2018] Seeing The Invisible - Open Heavens Daily Devotional Messages, By Pastor E.A Adeboye. 1It is not expedient for me doubtless to glory. I will come to visions and revelations of the Lord. The Bible tells us about the reality of both the physical world, which is the natural habitat of human beings, and a spiritual world that is ruled and controlled by the Almighty God. Although God created mankind and granted us access to the spiritual realm for the purpose of fellowshipping with Him, we lost that access when Adam and Eve shinned (John 4:24, Genesis 3:8). The spiritual world is very much as real as the physical world, but only those who have access to it can see the sights, hear the sounds and even participate in the activities of heaven. I pray that God will sanctify you and grant you express access to the realm of the Spirit in Jesus’ Name. Faith sees the invisible, believes the unbelievable and receives the impossible. This is the testimony of every great child of God who has walked on the face of the earth, such as Abraham, Moses, the prophets and the apostles. They all saw things that others could not see and they believed them until they were manifested physically. This is also the testimony of the Redeemed Christian Church of God. My Father in the Lord saw some things through the eyes of faith that were practically impossible to believe at that time, but they have become history today. When I became the General Overseer of the Church, we could only afford a one-bedroom apartment; I therefore started praying to God for a suitable home to accommodate my family. God then spoke to me one day that I should stop praying for a house because He had decided to build me a city. I received it by faith and today, this city has become a reality, and God is not done with us yet. I pray that you will begin to see the invisible from today in Jesus’ Name. Father, please sanctify me and open my eyes of faith today in Jesus’ Name. Open Heavens Daily Devotional Lessons was written by Pastor E.A. Adeboye, the General Overseer of the Redeemed Christian Church of God, one of the largest evangelical Church in the world and also the President of Christ the Redeemer's Ministries. Open Heaven [24 May 2018] Observing The Times And Seasons? Open Heavens Daily Devotional Guide was written by Pastor E.A. Adeboye, the General Overseer of the Redeemed Christian Church of God, one of the largest evangelical church in the world and also the President of Christ the Redeemer's Ministries.